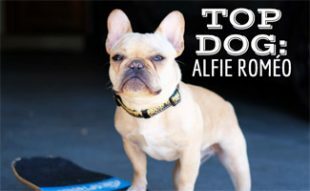 Top Dogs is a segment where we feature a Q&A session with a famous canine or canine owner. Our Top Dog(s) for July are Bonnie, a three year old black lab, and Brooklyn, a nine month old boxer/bloodhound mix. They are the sweet puppies of Morgan Thomas, a dear friend of mine and TV reporter in Shreveport, Louisiana. 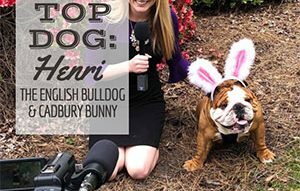 Since I met Morgan more than 10 years ago, she has always been in front of the camera working on a career in entertainment as well as a huge animal lover and advocate for helping find homes for furry friends. She’s like the Bob Barker of rescue pets. From fostering homeless pregnant cats to helping spread awareness for the joy and pleasure that pets can bring to your life. 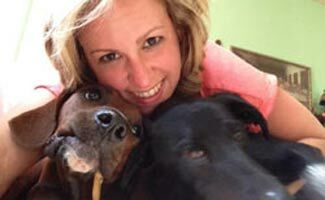 In addition to being an on-air talent, Morgan definitely has one of the biggest human hearts of anyone I know and it is my pleasure to have her share her dogs with you, our Canine Journal readers. 1. Can you share a little bit of your rescue story and/or how you got adopted or found your home with Morgan? Bonnie: My mama got me after experiencing a terrible tragedy with her last dog. Her name was Annabelle, and she was a yellow lab. Every afternoon, my mama took her to a field near her apartment to play Frisbee. But one day was different, this time Annabelle didn’t want to stop playing, and ran across a freeway. Once she realized what she had done, she tried to come back, but didn’t make it. She was hit by a truck right in front of my mama’s eyes. Two days later, she found me. I was just five weeks old, the runt of the litter, and the last one to find a home. Brooklyn: I was bottle baby! A real orphan! When I was just six weeks old, I was featured on my mama’s news station as the Pet of the Week. Her friend, and anchor, told my mom about me and said I needed to be saved. She contacted LA Baby Momma’s Rescue, and met my foster parents who had to bottle feed me since my dog mom died when I was born. It was love at first sight. Bonnie: I love playing with any human who can throw a Frisbee. I am the best Frisbee-catcher ever. I don’t care much about playing with other dogs because they don’t have hands and arms to throw Frisbees. Brooklyn: My mama and grandma are so fun! I try to play with my sister, Bonnie, but she doesn’t like to wrestle as much as I do. I LOVE playing with my best friend, Gunner, who’s a Great Dane. 3. What types of activities do you like to do in your spare time? Bonnie: Retrieving!! Whatever you can throw – ball, Frisbee, toy — I will catch it and bring it back. I also love the water; I got a new baby pool this summer, and I love laying around in it. Brooklyn: I like following my mama and sister around the house. I like to tear pillows up and take the stuffing out. I’m a puppy, I can’t help it. Once, I accidentally took the stuffing out of my brand new dog bed, I hope my grandma fixes it. But the best thing, is chewing on bones. I love bones! 4. Your mom is on camera for a living, do you like to be in front of the camera too? Bonnie: You should see my collection of Frisbee videos! I love showing off my skills in front of the camera. Brooklyn: I’m kinda famous already. I was the first ever Pet of the Week on Channel 6 (see photo to right, with her former pet name Jasmine). That’s how my mama found me. I was so cute on TV, she couldn’t resist! I also love getting my picture taken, and my mama says I’m photogenic enough to be a dog food model. 5. What’s your favorite treat or reward? Bonnie: Frisbee? Did I hear someone wants to play Frisbee? Brooklyn: I love all doggie treats. When my grandma came to take care of my mama when she had ankle surgery, I would wake her up three times a night so she would give me treats. 6. If you could be anyone for a day who would it be? Bonnie: I would be a professional athlete. Maybe compete in the Olympics. Is Frisbee catch or fetch an official sport? Brooklyn: That’s a hard question for a baby puppy. Hmm, I guess I would be Britney Spears. Bonnie: I’ve grown up around cats. My big brother, Andy, is a cat. I love him. Brooklyn: I love to bark at them. I try to play with my brother Andy, but he scratches my nose. 8. What discipline tricks seem to work on you and what don’t and why? Bonnie: I’m too smart for discipline. I like to get my way, and my mama hates punishing me. But now that I’m three years old, I’m trying to behave better, and be a good role model for my little sister. Brooklyn: Nothing much works for me, either. I’m too cute to get in trouble. I try to be good, though. 9. What’s your favorite outfit? Bonnie: I love my new collar that has my name in sparkly letters on it. I also like to wear burnt orange bandanas on college game days. I want to go to University of Texas at Austin when I grow up (just like my mama). Brooklyn: I also love my collar with my name on it. I like it when my mama crafts things for me to wear. 10. Who’s your favorite fellow celebrity dog? Bonnie: I love the dog, Enzo, in the book, “The Art of Racing in the Rain”. Brooklyn: The Dog Whisperer’s dogs. 11. You might not be famous (yet) but can you tell us a little bit about your career aspirations as a top dog? Bonnie: I want to be a champion Frisbee-catcher. I want to be the best ever. Brooklyn: I just want to win cutest puppy ever award. But according to my mama, I already won that. Bonnie: I want to encourage people to keep their dogs inside. 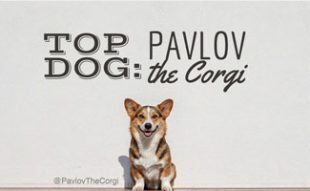 Outside dogs are often neglected, and not played with or petted as much as inside dogs. I love going on walks, and playing fetch outside, but I love to come inside and get comfortable on my dog bed. Brooklyn: Become a foster parent. There are so many animals out there that need homes. Find a good local rescue organization and find out how you can help. 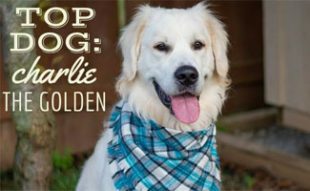 Have a Top Dog you think is worthy of being featured on CanineJournal.com? Leave a comment to share your nomination.